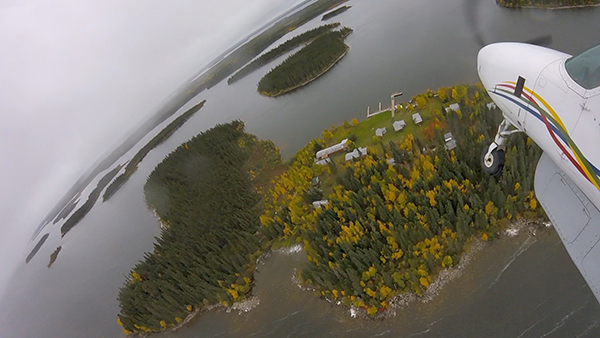 Few lakes in Canada trigger the kind of emotion that keeps Silsby Lake Lodge guests coming back year after year. This crystal clear glacial lake on the 55th parallel is home to some of the largest Northern Pike in the world. Silsby is blessed with key natural habitats for trophy sized pike. The contoured coves and points, shallow bays with deep drop-offs, rocky reefs and plenty of cabbage weed beds are full of giant pike roaming for food. Silsby also has plenty of rivers and creeks for spawning grounds in the spring. The creek from Silsby to High Hill has been named the "Aquarium" as a boat passing through it will see hundreds of trophy sized pike swimming in 2 ft. of water. This creek is "Off Limits" during the spring to eliminate any pressure and stress on these fish during the spawn. This varied habitat gives us hundreds of great places to fish. There is no need for expensive fly-outs or long boat rides at Silsby. In fact, you can reach any point on the lake within 20 minutes from the lodge. The 2018 season produced a record amount of Trophy Northern Pike for new fishermen to Silsby Lake. Our trophy count was way up from previous years for all fishermen to Silsby in 2018. A true testiment that our conservation policies are working at Silsby. In addition to our trophy pike, we also have excellent fishing for Walleye. It's very common for our guests to catch up to 50 Walleye. The Walleye will average 22 inches and guests have caught many Walleye in the 24-28 inch range. The mornings are usually spent catching Walleye for the upcoming shore lunch at noon. After a delicious shore lunch with homemade bannick it's out on the water, again, in search of monster pike. Our catch-n-release policy gives our guests a lot of opportunities for hook ups with giant pike. These ferocious fish will run you out of line, if you are not prepared. In fact, we had a couple different occasions this year where a rod was ripped out of a fisherman's hand. Bad news for the fisherman, but a good "fish story" none the less.